Budget: Rwonyo Bandas/ Lake view hotel Mbarara. 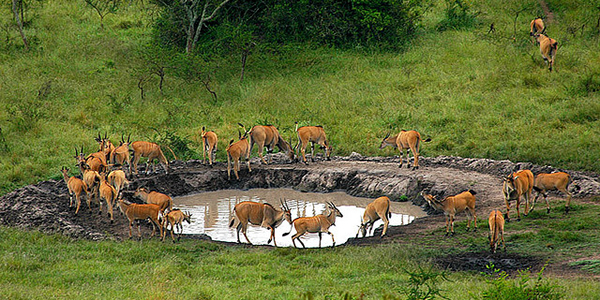 You will have breakfast very early in the morning and then your guide will take you for the early morning game drive. The park has got variety of tree species including the acacia, wetlands and while you drive through, you will find variety of animals that find the park a home like species of antelope which include the impala and giant eland, others include the lions, over 68 different species of mammals such as, jackals, Buffalo, leopard, Topi, Hyenas and plenty of Zebras and so many water birds like the Black crake, Heron, Pelicans, fish eagle, African Fin foot, cormorant among others, while the fringing swamps have got secretive papyrus specialists like the sitatunga antelope and red, black and yellow papyrus Gonolek. After the game drive, you will go have lunch in Mbarara town and then head to Bwindi Forest and arrive late and there have your dinner. Standard – Buhoma Lodge / Silver back lodge / Gorilla Resort Camp/ Nkuringo camp site/ Gorilla Safari Lodge. Breakfast will be serviced very early because you have to get to the ranger station for registration and briefing before 8 o’clock in the morning. You will get a ranger and then go for gorilla tracking in the dense forest, you need to have tracking gears like the boots, long trousers and long sleeves shirts to protect yourself from the insects and cuts as you hike up in the forest. While searching for the gorillas, you will come across other primates like the black-and-white colobus monkey, red tail monkey and chimpanzee, among others because this forest is a home to so many primates’ species. The tracking may take about 1-10 hours before you see them the time taken depends on the weather and where your group you may be tracking found its food on that day. Once you meet them, will have an hour to sit in the jungle with them to watch them play and interact before you can return to the lodge for relaxation or go for community walk but this optional and it’s at an extra cost. You will have your breakfast early and then go the morning game drive and during this drive, you can expect to see wildlife like lions, lots of Uganda Kobs, elephants, spotted hyenas and the leopard, to mention but a few. By midday, you will be finishing up with the game drive and drive back to the lodge, you rest a bit before lunch is served. After lunch, you will go for the chimpanzee trekking in the Kyambura gorge forest; you will meet not only the chimpanzees in this forest but plenty of other primates like the monkeys, baboons, among others will be there. After trekking, you will return the lodge for dinner. Day 6: Transfer back to Kampala. Immediately after breakfast, you will drive back to Kampala. You will have a stop over somewhere along the journey to have your lunch. Visit the Equator en-route and proceed to arrive in the evening. 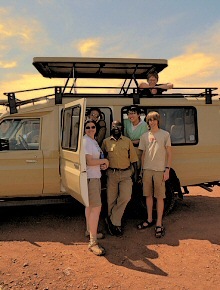 End of Uganda Safari with AA safaris and Tours ltd.